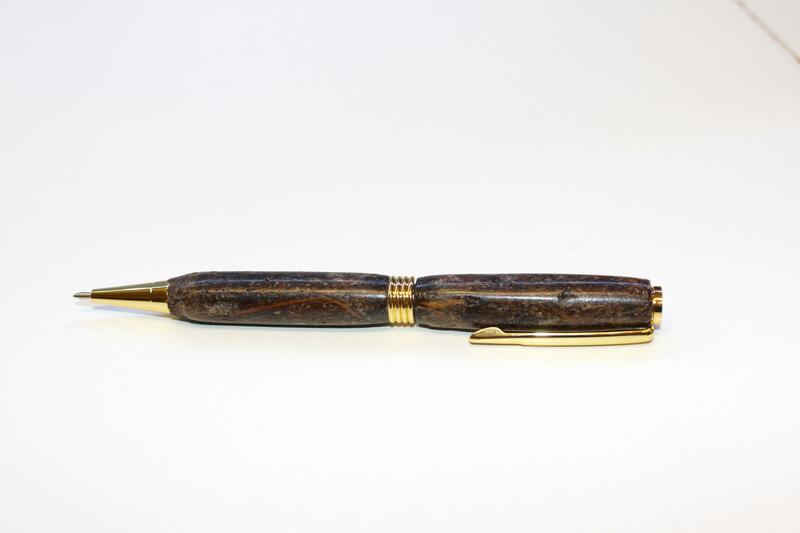 Skip, as a wood turner, stores a number of items that can be made into pens. He likes to keep a little stash of acrylic and wooden blanks of various colors and species, so that he can make a pen when the urge strikes. 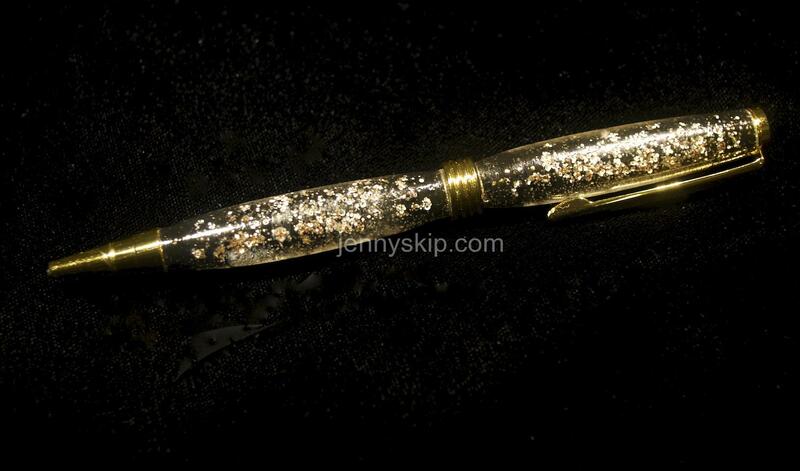 But, he also thinks up ideas for pen blanks that are anything but traditional: fire ants encased in acrylic, unsalted-in-the-shell peanuts, cigars from the Dominican Republic or Cuba, and other things. Having been a recent recipient of a contest prize from Zac at NV Woodwerks, a package of Alumalite, an awesome pen blank material, Skip has been wondering what his next project might be. Since getting the Dremel 3D printer, we’ve gotten it to print out a little stormtrooper action figure, a spaghetti measuring tool, buttons, earrings, a bow-shaped cookie cutter, a hockey puck with someone’s name on it in 3D lettering, and parts for a small sword. And we’ve also had our share of epic fails, too. The Internet is packed with .stl files, which the printer needs to read to do a project. Some of them that we’ve used didn’t pan out well. We made the cookie cutter using a Thingiverse Customizer. We’ve called upon our artistic family members to come up with some cool .stl files for us to try out. But we realize it is hard to just sit around and make things, when you’ve got a job and a family and grass to mow and laundry to fold, etc. Was Skip’s first attempt at a 3D printed pen blank a success or a failure? 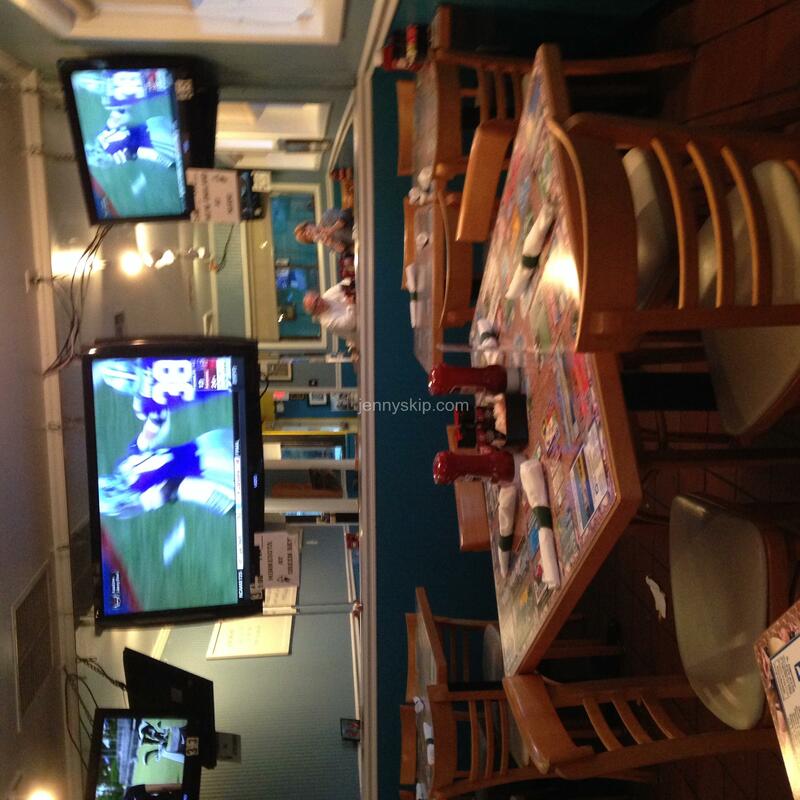 Take a look…. Is it the wand of Dumbledore, or the wand of Mickey Mouse the sorcerer, or maybe the switch your Aunt Gertrude chased you around the house with? No, no, no it’s a nostepinne! The first I ever heard of the nostepinne was a few years ago when my wife asked me if I could make a yarn swift and a nostepinne. Oh yeah, I can do that…. Sure… they are made out of wood, right? After some research I found out what these devices accomplish for knitters. 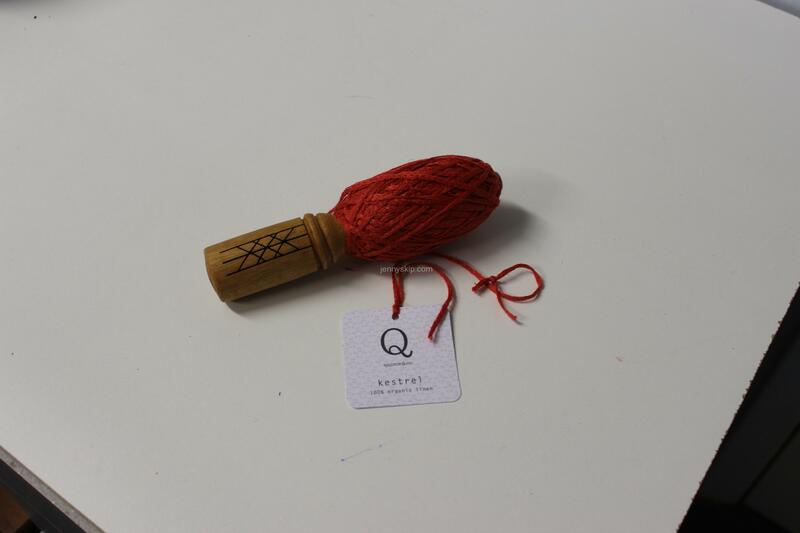 In the case of the swift, it is a device to hold a skein of yarn while it is wound into a ball. The nostepinne is used to wrap the yarn into a ball that will feed yarn from its center (a center-pull ball). The traditions associated with nostepinnes in Norway were many… they were given as Christmas gifts, engagement gifts, or a gift from a boy to a girl to show her he was interested in her. The more accomplished wood carvers would hollow out the handles of the nostepinne with captive balls inside. These could also be used as baby rattles. I have made my wife a couple of nostepinnes and even a swift. This time I decided to be a little more adventurous and add some carvings and maybe even some laser engraving to keep up with our theme of bringing 21st century techniques to 19th century crafts. A modern representation of the Web of Wyrd, the matrix of fate (wyrd) as woven by the Nornir, the fates of Norse legend. The emblem, nine staves arranged in an angular grid, contains all of the shapes of the runes and therefore all of the past, present, and future possibilites they represent. The web of wyrd serves as a reminder that the actions of the past affect the present and that present actions affect the future; all timelines are inextricably interconnected- in a sense, it is a representation of the tree of life. What qualities might a woodworker like to see in a candidate for president, the leader of our country? Woodturners like to work with green wood. 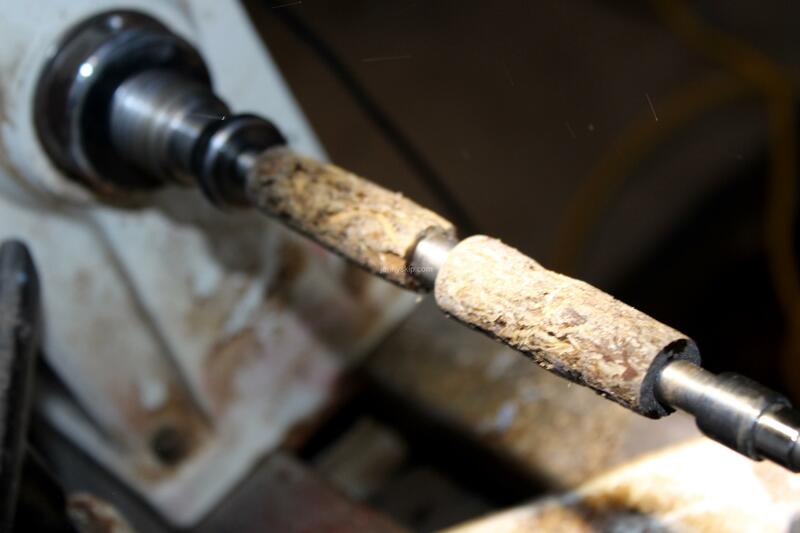 Green wood is easy to work on the lathe… however, it will probably sling water at your face shield. It also tends to change shape and crack as it ages, usually over a term of one year. We are generally impressed by its figure in the beginning but as the cracks form along the grain of this figure we are disappointed. So maybe we don’t want a green wood candidate for president. Some woodturners and many general woodworkers like seasoned, kiln-dried wood. This wood is about 8-9 percent moisture, very stable but more difficult to work. When you work it, it produces more dust, requiring you to wear a respirator to protect your lungs. This wood has been around for awhile and may surprise you as you cut it, to find some history buried in the fibers, that cause the wood to spring into a different shape. More experienced woodworkers may prefer air-dried wood. This wood seems to be easier to work, like green wood, but is more stable. So maybe we might like a president who is more like air-dried wood. There are many ways we can join pieces of lumber into some useful implement: loose tenons, mortise and tenon, glue and screw, glue and nail, pocket hole techniques, etc. Some of these techniques are quick to solve the problem of joining two dissimilar shapes of wood, but the connections are weak and will not stand the test of time. Some are strong and will provide an heirloom-quality connection. We need a president who can form strong, lasting commitments to bonding dissimilar people and ideals. Woodworkers like to have a variety of tools in their arsenals: hand tools, power tools, computerized tools. The trick is to select the right tool for the right job. Are we looking for accuracy, speed, portability or maybe some special quality or texture? It isn’t necessarily how many tools we have, but do we have the right tools for us? Will some of these tools be able to take our mediocre ability to a new level? Can these tools be trusted to come up to full capability quickly? Will the accuracy of these tools always be there when we need it? Will we end up spending dollar after dollar to keep these tools operational and will we get a good cost-to-benefit ratio over the life of our tools? Are the tools designed to be forward-compatible as the tool technology changes? In other words, will the battery we buy with the tool today work with the tool we buy tomorrow? We need a president who will select advisors, cabinet members and agency heads that provide the same qualities as a good arsenal of tools; a president who looks for the best tool to do the job and is not afraid of getting rid of a tool that has outlived its usefulness. Woodworkers have to deal with issues today that our forefathers and mothers didn’t directly deal with in the past, such as lack of common sense and being focused on our work flow. Woodworkers in the past had accidents, no question, but they also had a focus and method of workflow that kept them relatively safe. The tools we work with today run at high speeds, and in many cases they produce harmful higher-frequency noises. We can now hold machines in our hands that have cutting surfaces spinning at thousands of rpms. We turn large pieces of wood on lathes at thousands of rpms. We find that in this world of noise, speed, portability, dust, fumes, VOC’s, and flying wood particles that, like the OSHA cowboy, we can hardly get to our tools for all the safety devices we wear! Only kidding, I’m a strong proponent of safety devices, the right ones for the right applications. [See our blog on lathe safety.] Is the respirator we are using suitable for the size of dust particles we are exposed to, or for the fumes or type of VOC’s produced? Is our hearing protection suitable for the sound pressure levels produced at the frequency involved? Too much of the wrong hearing protection, and we may lose the ability to realize changes in our work environment that might give us insight to how our board is reacting to our cutting machine. Is our face shield rated to some safety standard and is that rating suitable for the job? A set of safety glasses won’t necessarily protect your eyes from an acetone splash occurrence. Gas- or liquid-tight googles won’t protect you from a three pound chunk of wood flying off the lathe at 2500 rpms. Safety is extremely important to the woodworker. A president of a leading power in the world has the responsibility to provide the correct level of safety for the homeland. The homeland needs to be constantly informed on what tools our administration needs to use to provide this safety. The tools must be specific to the danger and proportional in cost and application for the danger. We need to use our fantastic network of news and social media to inform the homeland on the basics of these without giving away the farm. Though we may be the leading power in the world, it’s a relatively small world, one to which our president has further responsibilities regarding safety and oversight. This is an awesome task for any one person or even a group of experts, and certainly should not be delegated to a group of political cronies . The president of our great nation should take on leadership in the world. But a leader is not a boss. I learned this from a very strong leader of a major corporation. The boss drives his men; the leader coaches them. The boss depends on authority; the leader on good will. The boss says “I;” the leader says “we”. The boss assigns the tasks; the leader sets the pace. The boss says “Get here on time;” the leader gets there ahead of time. The boss says “go;” the leader says “let’s go”. The world needs leaders but nobody wants a boss. The difference between a boss and a leader is that the boss gets compliance, the leader gets commitment. If you want commitment rather than compliance, you have to earn it and you have to keep earning it every day! 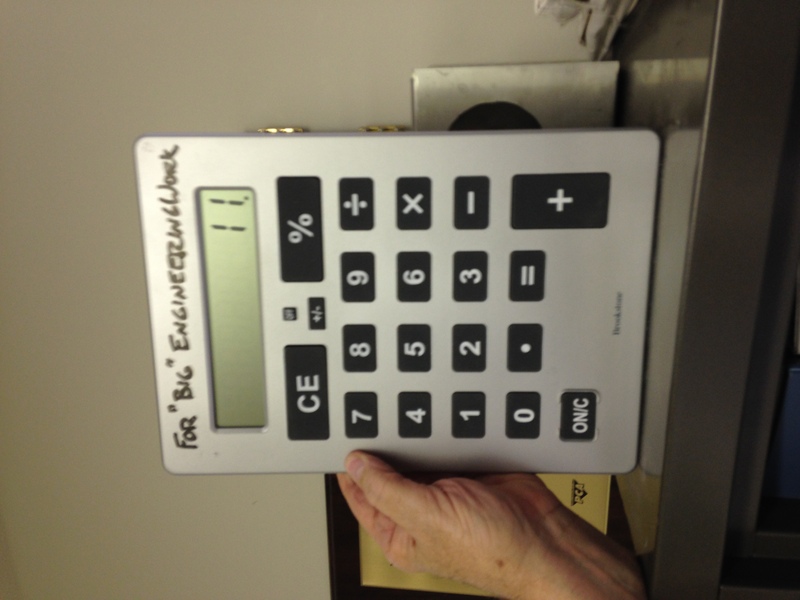 Woodworkers must try to be cost-conscious in their tasks. Wow, that is a stretch. Given enough resources in the form of currency, we probably would blow most of these resources on tools. But a perfect woodworker would only buy the tools needed to accomplish the day-to-day projects and would only purchase the quality of wood needed for the project. This woodworker would plan out a cut list to minimize waste, maybe even look ahead to see how the waste wood for one project would fit into the cut list of a future project. But let us not forget where this money comes from. As an economist would say, “there is no free lunch!” Someone has worked, provided a service, invested, taken risk, or borrowed to get this resource. The question for the woodworker becomes one of understanding the margin. What opportunity is the woodworker giving up to take this money to buy this tool or wood? What is the return, the sale of the woodworking effort, or a grin on a grandchild’s face? Woodworkers are concerned about our natural resources, especially wood. We see projects to use pallet wood for a multitude of applications. We see woodworkers concerned about sustainability of the wood we use. I found the concept of “urban forestry” a useful concept in solving a problem resulting from 21st century applications of sustainable energy. In a few words, I took advantage of a tax credit (supported by you taxpayers) and a feed-in-tariff contract from my local utility (paid for by the other utility customers) to install a photovoltaic system completely manufactured overseas except for the aluminum supports. Remember, “there is no free lunch.” If it hadn’t been for a desire to investigate this method of producing power, I couldn’t have considered this very ethical. So what has this do with woodworking? This environmentally-friendly solar system would only work at full capacity if several mature trees in my back yard were cut down. I called a couple of local tree surgeons and found two companies that could work together to cut down the trees, process them into usable lumber and sticker and stack the lumber in my back yard for air drying. So I now have a stock of wood that I can will to my grandchildren. What value should our president put on sustainability? What can we do to encourage good use of our natural resources, such as energy, air and water? In my engineering experience, I have found that there are not many technological solutions to our problems with sustainability that are sustainable. This may sound trite, but the only tried and true solution is conservation. This requires education at all levels of income and a change in our basic culture. This will not be an easy task. A president must be able to value the complex relationships involved in sustainability, and communicate that technology throughout the globe. It is not easy to see how a butterfly flapping its wings in the Butterfly Museum can result in a tsunami on the other side of the world. As a case in point, you can argue until you are blue in the face that carbon dioxide emissions are not causing global change. Who can argue that taking carbon buried in the ground for millions of years wouldn’t have some effect when reacted with the oxygen in our air? Water vapor is a global warming vapor and we put zillions of gallons of this into the air every day. A paradox…power plants evaporate gallons of water every minute to reject heat from burning fossil fuels that produce carbon dioxide. Conservation affects both effects. Woodworkers certainly don’t have to deal with the complexity of the problems facing our president every day but 300 million plus American patriots, including woodworkers, should respond to educated and sincere leadership. Every once in a while, defective wood finds its way into a woodworker’s shop. One type of defect in wood is a knot. There are knots that are loose and some that are firmly entrenched in the lumber. Woodworkers can generally see the knot as an enhancement to the project if it can be stabilized and used as an accent in the finished project. But when a loose knot finds its way across the workshop border, it presents a unique challenge. The woodworker may be able to isolate the knot from the rest of the lumber and then use epoxy to lock it in place. However, this may challenge the woodworker’s finishing process and may be a distraction to completing an heirloom piece of work. Another defect that finds it way into the shop is spaulted wood. This is wood on the way to becoming pulpy and rotten. However, if the woodworker can stabilize the spaulting, it may add diversity and beauty to the final project. This figure of controlled decay can ultimately enhance the overall project. A president must be able to provide leadership by understanding when an element may create an unstabilizing condition within what might be considered “the norm” in the global humanity. Can this element be stabilized, can it be integrated or must it be removed and discarded? What will be the butterfly effect if this element is isolated or destroyed? How does the global community support a president’s leadership in dealing with controlling these unstabilizing elements? A president must be able to comprehend the big picture, not an easy job for any human being. Some woodworkers strive to create a legacy with every piece of work… an heirloom. This work may end up in a museum, or it may be illustrated in many books. But a multitude of woodworkers are merely striving to make a functional work that can be used and enjoyed. It may end up eventually in a museum, but only because it withstood the test of time and showed the scars of everyday use. A president should focus on leadership that produces long lasting results… results that withstand the test of time. 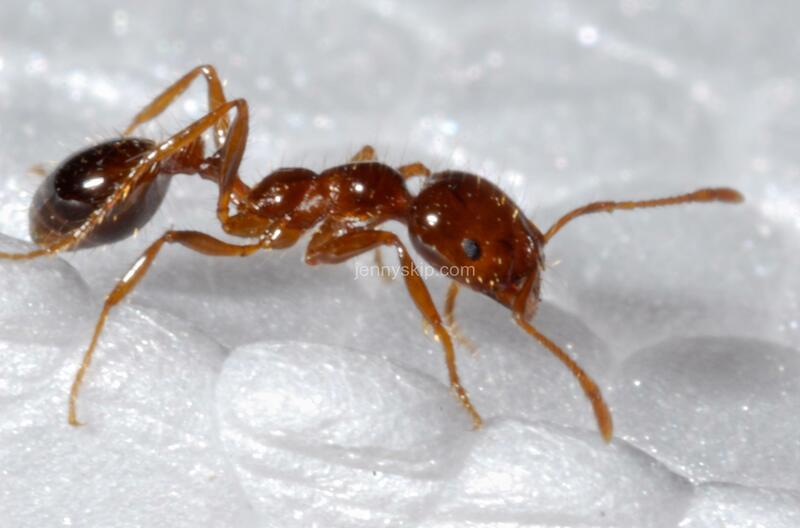 The red fire ant may have originally been found in the United States in the 1930’s. Since then, it has moved into several US states. This pest has invaded my property and wreaked havoc on my family more than once. My friend Sanford Porter is a researcher and an authority on red fire ants. I decided to try to make a fire ant pen for him. I asked Sanford to give me some background information on these ants before I began the fire ant pen project. “The fire ant Solenopsis invicta is one of the world’s 100 worst invasive alien species. Fire ants are small reddish brown ants that range from about 1/8 to 1/4 inches in length. Fire ant workers build large earthen mounds which they use as solar collectors. Workers move the brood up and down in the mound tracking warm temperatures that allow them to grow faster. Florida pastures contain 20-50 mounds per acre and have an average of 1,500-3,000 fire ant workers per square yard. Mature colonies can contain >250,000 workers which get very angry if someone steps on their nest. Young children are especially susceptible to fire ants stings until they learn to recognize the mounds. A fire ant sting typically hurts for a few minutes leaving a red mark which develops into a white pustule by the next day. 1-2% of people are allergic or sensitive to fire ants stings and they must always be alert for fire ants because they are virtually ubiquitous where ever people live in the southeastern United States. As is the case for most exotic species, invasive fire ants were introduced without most of their natural enemies known to occur in their native South American range. As a consequence fire ant population densities in the USA are 5-10 times higher than those in South America. Currently, imported fire ants infest over 340 million acres in the USA and cost Americans an estimated 6 billion dollars annually for control and to repair damage to agriculture, households and other economic sectors. Fire ants are serious pests because they: 1) prefer human-modified habitats, 2) are aggressive stinging insects whose venom can cause allergic reactions in people, 3) have huge reproductive potential (like weeds), and 4) can negatively affect a number of native ants and other ground-dwelling animals. However, it is important to note that negative impacts on native ants are not universal and can vary with habitat and the presence of high density polygyne fire ant populations. 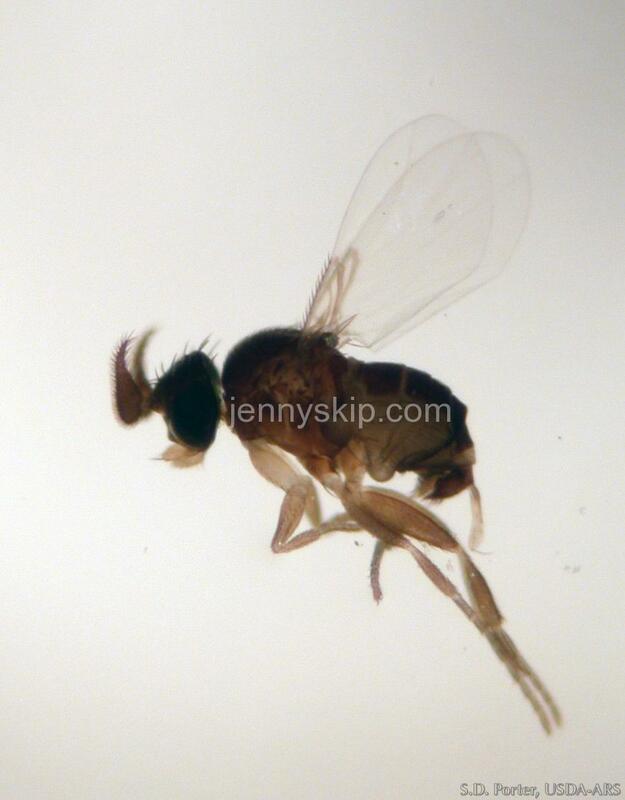 In the last decade, S. invicta has emerged as a global pest, with new infestations established in Australia, Taiwan, mainland China, Mexico and many Caribbean Island countries. All this information (are you suffering from information overload yet?) spiked my interest in this pest. Fire ants have personally produced pustules on my body. When I asked my friend if he could get me some fire ants to cast into a pen for him, he quickly produced approximately 30,000 dead fire ants for me to experiment with. Don’t ask me how he knew there were 30,000 of the little buggers. I think he knows what a typical fire ant weighs and worked it out from there. He dried half the sample and dried and de-fatted the other sample. He thought the de-fatted ants might cast better in the acrylic. These ants are not very big, each 0.08-0.2 inches in size, so the bag of ants he had given me looked a lot like a bag of dirt! I contacted Zac Higgins at NV Woodwerks to get some advice on how I might cast these into a pen blank. Zac seemed to think that I would have the most success gluing the ants to the brass pen tubes prior to casting. Seemed like a good approach. I roughed up the two brass tubes in a slim line pen kit using sandpaper and then painted them with black lacquer paint. 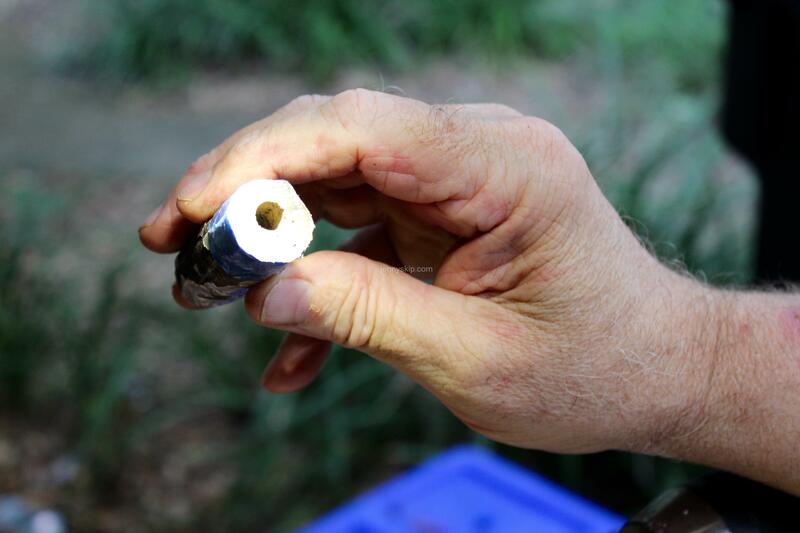 Then I coated the tubes with thick CA glue and rolled them through a pile of the dried, de-fatted fire ants. I applied additional coats of thin CA glue to try to stabilize the coating of fire ants. The two coated tubes were then installed in a silicone Resin-Saver mold for this type pen blank. Alumilite Parts A and B were weighed out in equal weights (or so I thought), mixed thoroughly and poured into the mold. BUT…I had not weighed out the parts accurately and had more A than B. This resulted in the mixture turning white. I went ahead and turned the blanks on the lathe, hoping that when I got down close to the ant layer all would be well. The resulting pen is shown below. So I decided to try another method. This time I mixed the ants with the resin mix. Painted the brass tubes black and installed the painted tubes in the mold, then poured in the ant-resin mixture. This time the mix was correct and the resin cured as a clear acrylic. I temporarily forgot that these ants float! So that is what a bunch of them did. 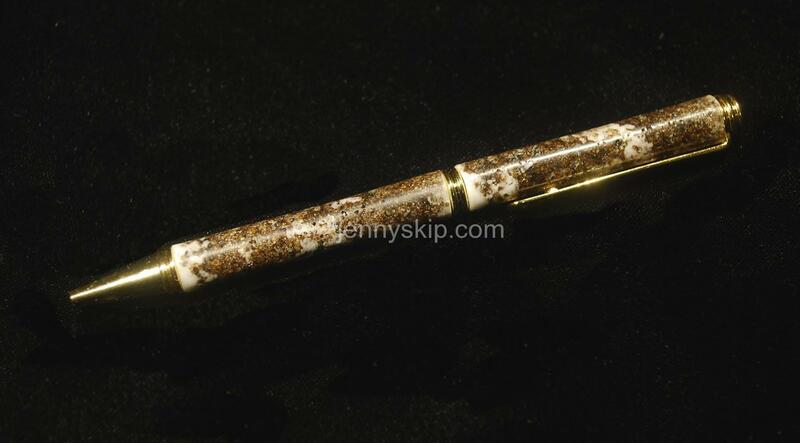 This resulted in pustules that were sheared off during the turning as you can see in the photo of the finished pen below. Sanford was happy with both pens, but I want to try again. I will revisit the method of gluing the ants on the tubes with a proper resin mix. More on this later…. After Christmas!! In the previous blog, Snowman 2, we covered the design and production of a prototype snowman ornament for our 18 grandchildren. The next phase of this project involved the mass production of the 18 snow-people (politically correct for snow women and snowmen). Looking at the calendar, I realized that there was no way I was going to be able to reproduce the prototype snowman without some 21st century help. I had purchased a Vega lathe duplicator for my large lathe and my midi-lathe some years ago. So I pulled out the smaller duplicator and attached it to my Jet midi-lathe, worked up a template for the snowman profile and got to work. Taking several 4 foot long pieces of southern magnolia of the proper dimensions (about 2 ½ inches by 2 ½ inches ), I cut 18 blanks, each 6 inches long. Then, sitting in front of the TV watching some old episodes of MASH, I marked the centers on each end of the blocks. A 5 gallon bucket worked well for transporting all the blanks around while I was processing them. Then off to the lathe. I have my midi-lathe on a roller stand, so I rolled it outside to take advantage of the wonderful Florida weather and natural daylight! 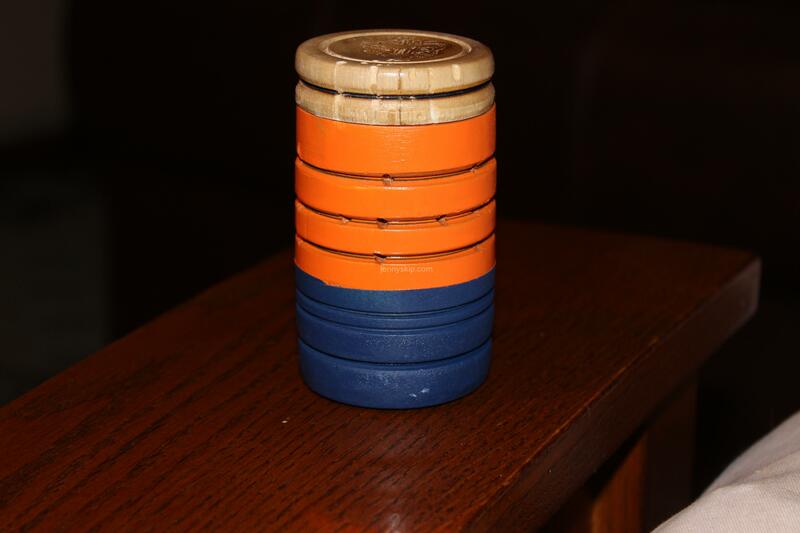 Each blank was then turned into a 2 inch diameter cylinder using a roughing gouge. This went a lot faster than starting with the square block and using the duplicator to round off to a cylinder. Once I had 18 cylinders turned, I then remounted each blank and with the duplicator, cut the profile of the snowperson. I then sanded from 80 to 400 grit using Abernet. There was a small base remaining on each of the turned profiles that I decided to leave. It actually looked okay when the snowpersons were finally painted. I sprayed each of the turned profiles with a white high gloss, lacquer sealer and then turned them over to my wife to add the final touches. She had gotten some snow acrylic paint that gave the snow-people a snow-textured look. My wife went with pink accents for the snow-women. The next step was to add our name medallions with date to the bottom with the name of the grandchild. Then off to the mailbox. Several years have passed since I took on the parental role of the Tooth Fairy, but now, with 18 grandchildren, my thoughts have turned back to this custom as I watch my children turn into Tooth Fairy proxies. I must say, I was a very clever Tooth Fairy protégé. I won’t share the details of the deception I practiced on this blog site in case some of my more tech-savvy grandchildren read this blog. I have sent my underhanded Tooth Fairy techniques to some of my children via secured server (the one in my laundry closet). The history of children being paid for their lost teeth goes back to early written records of the Norsemen and Northern Europeans. In Northern Europe this tradition was called ftand-fé or tooth fee. “During the Middle Ages, other superstitions arose surrounding children’s teeth. In England, for example, children were instructed to burn their baby teeth in order to save the child from hardship in the afterlife. Children who didn’t consign their baby teeth to the fire would spend eternity searching for them in the afterlife. The Vikings, it is said, paid children for their teeth. In the Norse culture, children’s teeth and other articles belonging to children, were said to bring good luck in battle, and Scandinavian warriors hung children’s teeth on a string around their necks. Fear of witches was another reason to bury or burn teeth. In medieval Europe, it was thought that if a witch were to get hold of one of your teeth, it could lead to them having total power over you. There doesn’t seem to be any consensus on what the Tooth Fairy looks like. Images range from dragons to little fat men, to little winged girls. The general view is that the Tooth Fairy is more like the little winged girl. This was the image that came to my mind when, as a child, I put my tooth under the pillow. Practically, this could have worked since the average tooth payout was a dime and I could see how a little winged girl might be able to sneak under my pillow, take my baby tooth and leave a dime. But with the 2013 survey by Visa Inc. reporting the average US payout as $3.70 for a baby tooth, I’m not sure a little Tooth Fairy could carry around this much cash. It may still be a bargain for the Tooth Fairy since adults probably paid the dentist several hundred dollars for the care of this tooth that ultimately fell out! 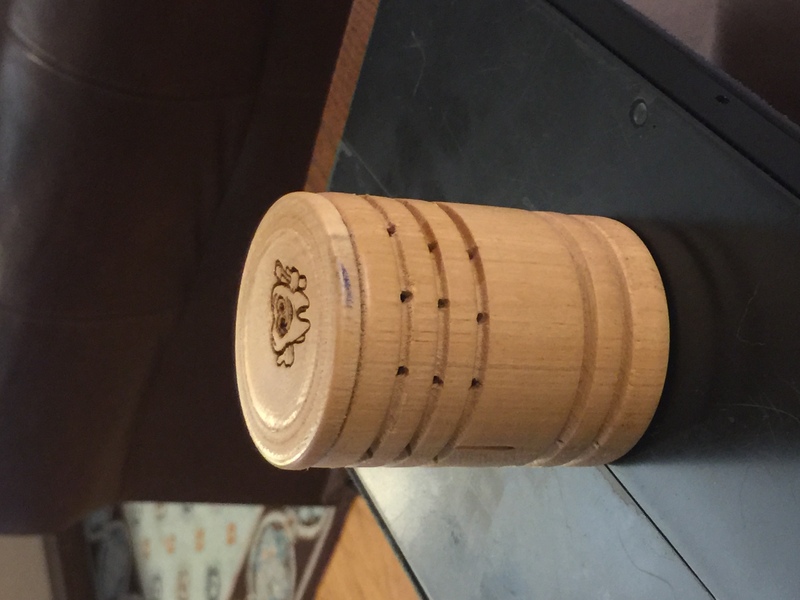 A few months ago I turned a small lidded box for one of my grandchildren to use as a tooth fairy box. I used pyrography to place her name on the lid of the box and some decorative piercing around the side. It was an ugly prototype but my son loved it and took it home to his daughter. The moral of this story is to never bad mouth one of your creations, no matter how ugly it may be, because in the eye of the beholder (my son), the pig’s ear evidently had a silk lining. So, on to prototype two. I took a piece of southern magnolia, my favorite prototype wood, and turned a 4-inch long, 2 ¼-inch diameter cylinder between centers and then cut a ¼-inch long tenon on one end. I mounted the blank in a scroll chuck and used a 1 ½-inch Forstner bit to drill out the bottom to a 1 ¼-inch depth to accommodate an electric tea light with a fake flame. Originally I was only going to drill to one inch because I had some of the tea lights that light up on the inside and are flat with a little fake wick. The flame would cast more light above the tea light, which would better suit the purpose of my design. I then sanded the bottom inside and outside of the box. I turned the box around on the lathe, setting the bottom of the box in the scroll chuck. I didn’t worry about chuck marks on the box because I had plans for dealing with that later. I then used a parting tool to form a 1 3/4-inch diameter tenon about a ¼-inch down from the end of the blank. This tenon would provide the socket fit for the lid. I then sanded and applied several coats of sanding sealer and parted off the lid. Using a 1 5/8-inch Forstner bit, I drilled down to about ¼-inch above the hole drilled into the bottom of the box for the tea light. The ledge this formed would be used later to support a clear plastic disk. Then, using the tenon on the lid as a guide, I opened up the sides of the 1 5/8-inch hole for the lid tenon to fit. I used a parting tool to cut three decorative grooves in the side of the box just below the lid opening. Later I would drill holes around the box in the grooves to let the light through. I sanded and finished the top portion of the box. Wrapping the top section of the box in paper towel to protect it from the scroll jaws, I turned the box around and secured it in the chuck. I didn’t worry too much about the scroll making marks on the sides of the box since the jaws sat in the grooves I had cut. I then turned grooves in the bottom section of the box where there were scroll marks, did some light sanding and applied another coat of sanding sealer to blend in with the top portion of the box. I was going to laser engrave a cartoon figure of a tooth holding a toothbrush, with the child’s name on a contrasting piece of wood, and glue this to the top. This is why I only made the top ¼-inch thick on the prototype. However it was easier to just laser engrave directly on the lid, so in the final versions of this box, I made the lid ½-inch thick to begin with. Since I had originally thought of gluing on the engraved cap to the lid, I had used a pointed live center which left a divot on the top of the lid. This would have been covered up by the engraved cap. On the final versions, I used a cup center. The laser engraving worked well on the sanding sealer surface. I didn’t fuss about centering the image on the prototype so it came out a little off center with the divot in one of the eyes! I cut a plastic disk out of the side of a clear plastic container that rice came in. After drilling all the holes in the grooves, I placed the plastic disk on a bed of thick super glue applied to the ledge in the box. This let the light through to the upper part of the box where the holes had been drilled and acted as a bottom for the upper compartment holding the tooth and cash!! I must mention here that when the Tooth Fairy visited my house when I was a child, I received a dime for each tooth. This dime wouldn’t have much effect on the amount of light getting into the upper compartment of the tooth box. In testing the final version of the box, a paper bill was folded and inserted into the box and the tea light was turned on. The light seemed to still shine through the holes. If the Tooth Fairy decides in the future to use debit or gift cards, I’ll have to revisit the design! If you were to use the other flameless type tea light, you could drill holes around the bottom set of grooves in the box to let the light through. The most recent version of the fairy tooth box is shown below. I’m not satisfied with the proportions of this box. The height-to-diameter ratio is about 1.77 which should be pleasing to the eye, but to me, the box seems to be too tall. Maybe if the box was tapered with a larger diameter base it might be more esthetic. The location and the spacing of the grooves needs to be investigated also. I plan to work on the design and will provide a post in the future to describe these efforts. A special thanks to my friend Adam and one of his relatives for the wood. Daryl has an unbelievable supply of wood which he will be selling to us wood-starved Florida woodworkers. I have noticed over the last year that more and more YouTubers are doing shop updates and shop tours. I have been reluctant to do this for several reasons: 1. I don’t see any value in the content (which will be obvious by no. 2) and 2. My shop exists in a very high entropy state. So what does this mean? You may have heard some engineering nerds like me say “I live a very high entropy existence!” The easiest way to understand this is to look at the statistical thermodynamic definition of entropy**, which says in a nut shell that as disorder increases so does entropy. I could give you the Boltzmann’s equation at this point, but take my word for it, there is a relationship between the probability of finding something in my shop to the disorder of things in my shop. Zero entropy might mean that everything in my shop was neatly organized and the probability of finding a tool was 1. The Boltzmann equation would take the natural log of 1 and get zero. As my shop maximizes its entropy, the entropy increases…..a natural tendency of all things in the world. So my shop is just following the natural progression of all processes in the world! So no matter how hard I work at organizing my shop, entropy rules and drags me back to disorder, so why fight it? Organizing takes time and at my age, time is valuable. But being organized up front, saves time in accomplishing projects. So to solve this problem, I invite my grandchildren over every other Saturday to help organize. This presents new problems, however. In the Universe of my shop there is limited space, so as we organize one solar system of the Universe, striving to slow down the increasing entropy, we end up maximizing the entropy of other solar systems in my shop Universe. So sometimes to help stabilize my Shop Universe, we resort to taking some items, close our eyes, and throw them in that black hole hovering outside the shop, the garbage can, thus increasing the entropy of the land fill. Or I give some of my older, more out-of-date tools to friends and relatives, thus increasing the entropy of their shops. There are cases when somehow a battery charger in my universe disappears into the asteroid belt of dust bunnies under the work benches and I have to buy a replacement, only to return to the shop and find the other one in plain view, on a pile of turning tools. One positive thing about your shop universe undergoing expanding entropy: the untrained observers (relatives) think you are up to your asteroids in projects! ** note from jenny: For non-engineering nerds like me, you might want to google the definition of entropy. To get a clearer picture of Skip’s shop, look at definition #2, LOL. Christmas tree ornaments are favorites for lathe turning projects. Carl Jacobson and Alan Stratton are sponsoring their fourth annual Christmas ornament contest for wood turners. See their You Tube channels for details. Over the 15 years I have been turning wood projects, I have only turned Christmas ornaments once. That was after watching a video on how to turn a “fly house” from a branch out of the yard. This mini-birdhouse was a favorite with the grandchildren. Carl’s challenge reminds me that making Christmas ornaments for the grandchildren would be a good project this year. With 18 grandchildren, it may be a monumental project! To keep it simple and do-able in the time I have, I’ve decided to turn snowmen. This won’t win any competitions but hopefully it will be a winner with the grandchildren, especially if I put their names on the ornaments. In preparation for this project, I referred to the “no-fooling-around” resource on the web, the Wikipedia site, to learn more about snowpeople. 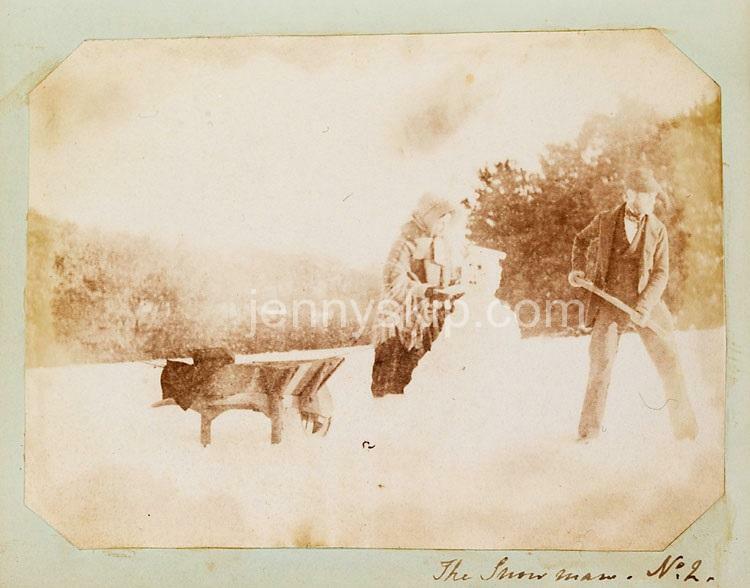 One of the first photographic records of a snowman was taken in about 1853 and is shown below. Evidently there is no clear record of when the first snowman was made. Maybe it happened when a Neanderthal decided to make one to attract and trap a wooly mammoth. Bob Eckstein, author of a book entitled The History of the Snowman, documented snowmen constructed during medieval times by studying artistic work found in European museums, art galleries and libraries. One of the earliest illustrations he found was dated 1380. Snowmen have been thrust into the competitive genre of “who is the biggest?” A record was established in 2008 in Bethel, Maine with a 122 foot, 1 inch snow-woman. Prior to this in 1999, Bechtel, Maine produced a snowman named Angus, 113 feet, 7 inches tall weighing 9,000,000 tons! Okay, way too much information on snowmen. Because making a snowman is a fun winter activity, and decorating for Christmas is also a fun winter activity, it seems logical that our next project will be a snowman ornament. The Hallmark Information web site offered some historical insight into Christmas decorating. Christmas trees have evidently been a holiday practice as far back as the 15th century in Germany, appearing in the Americas in the 1700’s. Evergreen trees showed up in religious plays adorned with apples and were referred to as Paradise trees. Later they were used in homes, and ornaments of small pastries in the shapes of stars, angels, hearts and flowers were hung on the trees. The custom of having Christmas trees spread through Europe and eventually was brought to America by German mercenaries fighting in the Revolutionary War. By the 1800’s Christmas trees were very popular in the United States. Many of the commercially available ornaments came from Germany. F. W. Woolworth brought the ornaments from Germany into the Five and Dime Era, selling $25 million worth of Christmas ornaments by 1890. At this time the German-made ornaments were cast lead and hand-blown glass. Over time, ornaments became more elaborate and more expensive. By 1925 Japan had entered the market and was shipping large quantities of ornaments to the US. Czechoslovakia entered the market and by 1935 over 250 million ornaments were finding their way onto US Christmas trees. By the beginning of World War II, American companies entered the ornament market. In 1973 Hallmark introduced ornamental glass balls. I couldn’t find many historical notes on when hand-made wooden ornaments originated but they must have been used on early Christmas trees. Christ-Kindl Markt mentions “shaved wood” ornaments created by farmers, in their essay on German Christmas ornaments history. A wooden snowman seems to be an appropriate historical object to adorn a Christmas tree or a holiday table. But one last concern, since these are going to my grandchildren, who range in age from about one year to 17 years: safety. I don’t mean safety at the lathe, that’s a topic for another discussion, but safety associated with the ornament. The ANSI/ASTM approved ornament would probably have to be made of surgical grade stainless steel, one foot in diameter and equipped with seat belts! It would have to comply with mechanical/physical testing (choking hazard), flammability testing (oops maybe I’ll need to soak the wooden snowmen in a flame retardant such as boric acid), chemical testing (oops again, the boric acid may be toxic and I guess lead based paint is out of question), electrical testing (check, we got this covered) and labeling (guess it will have to be 12 inches in diameter to accommodate all the labels or I could use the trick like they use on TV: ultra fine print to list all the side effects that can result from use of this ornament). I think I’ll play it safe and make some wooden table snowmen ornaments and paint them with child-proof paint in case the grandchildren gnaw on them. I’ll provide a lengthy Christmas letter with the ornament gift, that enumerates in great detail everything our family has done over the past year and sum it up with a three page, ultra fine print disclaimer associated with the use of the ornament. I chose Southern Magnolia, AKA poplar, to make these snowmen, primarily because I had tons of it and secondly, I was going to paint them. Maple would have probably been a better choice but all of my maple is 4/4. I cut 2 1/2 inch square blanks 6 inches long and mounted them on a midi Jet lathe between centers. I mounted a Stebcenter drive in my scroll chuck and used this to turn the blank into a cylinder with a tenon. The blank was then mounted in the scroll chuck with the tenon and I let the chips fly. I used a combination of carbide tipped tools, a bedan and thin parting tool. I did do some planning before I started turning. I tried to adhere to the 1/3 – 2/3 proportions. I do have plans to make a Fibonacci gauge but in this case I relied on the good ol’ 1/3 – 2/3 rule. Once the snowman was parted off the lathe, my wife took over and turned this lifeless chunk of wood into a lively snowman. I also wanted to provide my grandchildren with another memorable gift for the Christmas holidays, so in spite of my wife’s advice, I decided to add my Annual Christmas Satire to this blog. I must add a disclaimer that all figures in this essay are fictitious and any resemblance to anyone alive or dead is coincidental. It does answer the question…. Does Snowman 2 have a sibling and if so, what does he or she do? Snowman 2’s birth parents had long disappeared sometime during the 1950’s while extensive above ground testing of the hydrogen bomb was taking place in New Mexico, Snowman 2’s birthplace. All that remains of Snowman 2’s parents is the Hot Mud Spa at the New Mexico Talladega Spa and Resort. Snowman 2’s brother Shaved Ice was adopted by Elmer and Madge while they were on a trip to Havana, Cuba for their annual attempt to smuggle Cuban cigars into Miami, Florida. The cigars were painted yellow and shipped out of Cuba in crates of bananas in keeping with their produce business. Shaved Ice was found living in a dumpster behind a Cuban tattoo parlor, where, as a 10 year-old child, he would perform customized raps for tattoo parlor patrons. When they heard him sing “Elmer and Madge done outfoxed the Badge” to the tune of the Tiny Tim favorite “Tiptoe through the Tulips”, they knew that they had to have this little boy as part of their family. Shaved Ice grew up to become a famous rapper at night while running the cigar smuggling business for Elmer and Madge during the day. All this went on year after year without Snowman 2’s knowledge. Snowman 2 did follow Shaved Ice’s climb to success as a rapper but was not aware of his nefarious cigar smuggling activities. It was only many years later that a series of events drove a wedge between these two loving brothers. While on a gig at a Walmart parking lot in Carson City, Nevada, Snowman 2 encountered a young undisciplined boy by the name of Sheldon Wanarski, who grabbed three of Snowman 2’s buttons, typically made of lumps of coal, and ran off to a waiting car. Later it was learned that this little fellow was actually from a very disadvantaged home where the family barely had enough money to eat, much less pay to heat their home in the bitter Nevada winters. The little boy had taken the buttons to burn in their stove for space heating and to warm their porridge for dinner. Regardless, Snowman 2 was left buttonless, standing in the Walmart parking lot surrounded by hundreds of laughing, unsympathetic children. Elmer and Madge were infuriated and spirited Snowman 2 off to their walk-in freezer while they figured out what to do. They contacted Santa to see if he could supply new buttons of coal, but were disappointed to hear that Santa had moved over to penguin poo as a substitute for coal. Elmer and Madge could not bring themselves to a decision to make this substitution for Snowman 2’s buttons. Upon hearing of this tragedy, Shaved Ice had a suggestion. He knew that Cuba still had connections with Russia. After the Cuban Missile Crisis of the 60’s Russia had begun to smuggle pin ball machines into Cuba. The Castros did not support any activity that brought joy to the Cuban people, so pin ball machines were outlawed. Over time, the unlawful entertainment machines advanced from pinball machines to Play Stations. As energy supplies in Cuba were strictly controlled by the government, the Cuban people had to pay exorbitant prices for energy. A black market developed, with the Russians smuggling lumps of coal into the country disguised as power supplies for Play Station games. Shaved Ice contacted his Russian customers for Cuban cigars and struck a deal. Russia would skim off some of the coal disguised as power supplies and divert these to Shaved Ice where he would paint them yellow and ship them into the US as bananas. All of this worked very efficiently until Snowman 2 happened to look more closely at one of his buttons and saw it was marked “made in Russia at forced labor camps”. He immediately went to Elmer and Madge and demanded to know what this meant. Elmer was never one to keep a secret and spilled the beans, telling Snowman 2 the whole history of his step brother and their smuggling business. Snowman 2 and Shaved Ice have since made peace with one another and now Snowman 2 uses penguin poo for buttons. After watching Sam’s video at Wyoming Wood Turner on lathe safety and watching Martin’s Turner’s Journey sharing of his recent accident, I decided to put out a copy of a report my undergraduate students produced on face shields. My interest developed after reading of a horrible accident in the AAW journal that a woodturner experienced even though she was wearing a face shield. The students came to my house, took a few lessons on wood turning and tried out some of the face shields I use. They then set out to study this further. What follows is their report. I edited out the equations because of the problems in translating the original PDF file into the blog. If anyone wants a copy of the complete PDF, please send me your email address. I would welcome your comments on this study and will pass your comments on to the students. Of course there is a lot more to lathe safety besides the size and speed of the turning but maybe this will inspire turners to look for other means of protection or encourage manufacturers of face shields for wood turners to come up with new designs. Regardless of the type face shield we wear, there is no substitution for common sense. Stay out of the line of fire when possible. Turn under those cages that are sometimes provided with lathes in lieu of using them for tool racks. 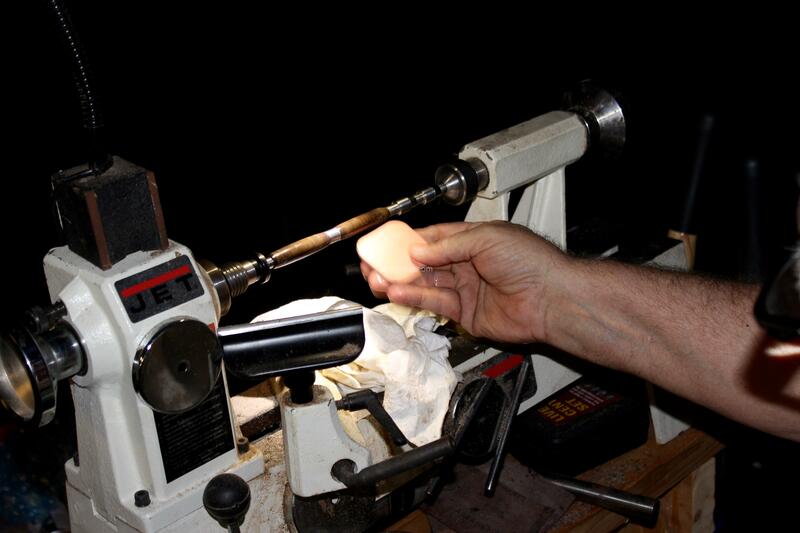 Use the best practice in mounting your blank to the lathe. Inspect your blank carefully for defects. Use your ears. If it doesn’t sound right, it may be wrong. Stop your lathe often and check for potential failures. Don’t wear rings or long sleeve shirts. I guess the list could go on and on. 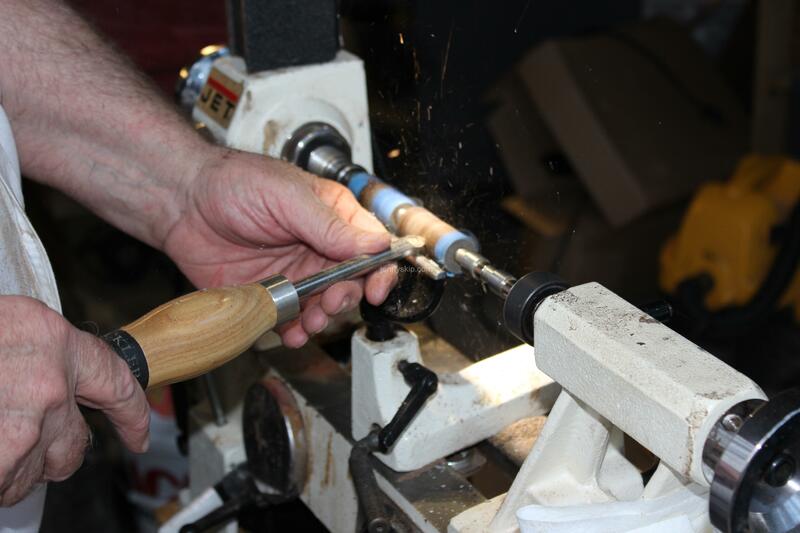 The process of shaping wood on a lathe, “turning”, involves applying significant forces by hand to material often of irregular surface profile and cross-section rotating at high velocity, and as such, precautions against accidents must be taken to avoid serious injury. 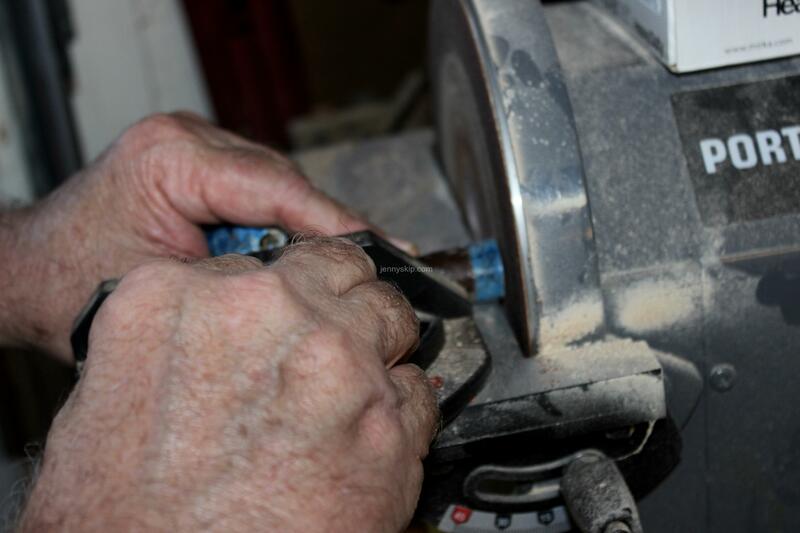 In addition to wood shavings and debris common to all wood turning projects, imperfections throughout the wood can cause hand tools to shift unexpectedly and cause failure within the workpiece, presenting a risk for injury to the operator. Faults within the wood including grooves, burrs, and rotted sections can cause a hand tool to break off significant segments from the material, and improper mounting of the workpiece on the machine can cause the workpiece to release from the chuck and collide with the operator. Even with the use of a guard or shield which can be fixed to the base of the lathe, there is a danger of large wood fragments being thrown from the lathe toward the lathe operator, and it is at the discretion of the operator what the degree of protection is required for a project. Lathe operators typically wear eye or face protection while working on a piece to protect from reduced visibility and injury from airborne detritus. The aim of this report is to detail the results of a study of the ability of a commercially available face shield to absorb the impact energy from wood of various species and sizes at different spindle rotational velocities in the scenario of turning a bowl blank. This study was conducted in response to videos on the internet in which experienced woodworkers were wearing the recommended safety equipment but were still injured when struck by a sizeable fragment. Fragments from a workpiece can be propelled with sufficient energy to cause bruising, concussion, and even fatal damage to the head, even when the operator is wearing head protection which meets nationally-accepted safety standards. It is posited that the majority of face shields available commercially are not adequately designed to absorb the energy of impact of a larger projectile. The ANSI (American National Standards Institute) standards which must be met by commercially available polycarbonate face shields state that the shield must be able to absorb 0.84 J of impact energy, while a “high-impact” shield must absorb 4.41 J . The ANSI standard is documented in ANSI/ISEA Z87.1-2010 . An experiment was devised to simulate the impact of a projectile from a wood lathe failure and determine the adequacy of the shield to absorb the impact, and further theoretical study was conducted to estimate the effectiveness of commercially-available face protection against wood lathe failures which could not be replicated in the previous experiment. 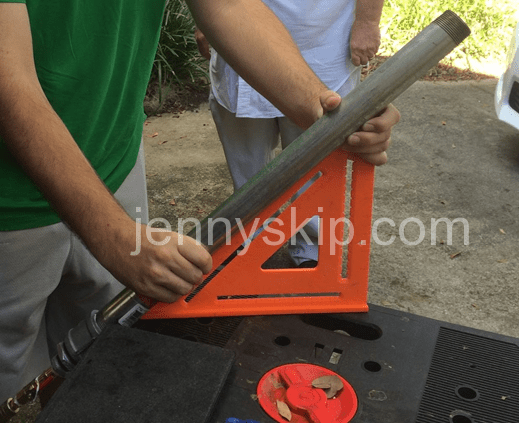 When researching the different types of face shields available for woodworking it was determined that there is two basic styles. The first involves just a headband that holds a plastic shield that covers the wearer’s face. The second, more common, shield combines a helmet and face shield, or provides some rigid structure or protection for the wearer’s forehead or around the sides of the plastic . This second style also comes with the option for a pressurized respirator to keep the wearer cool while working . Examples of both types of face shields are shown in Figure 1. Fig. 1: Examples of both basic types of face shields used in woodworking  . The American National Standards Institute (ANSI) provides a rating scale for each face shield. Under ANSI ratings, there are two protection levels; the lower level or basic impact, which must be achieved by all face shields sold commercially, tests the strength of the shield by dropping a 1 in diameter steel ball weighing 68 g from 50 inches onto the shield at the point which corresponds approximately to either of the wearer’s eyes . These hold an ANSI rating of Z87, which means the shield can withstand 0.87 Joules of energy during an impact. The upper level or high impact rating utilizes a high velocity test where a ¼ inch-diameter steel ball bearing weighing 1.06 g is shot at 300 ft/s towards the face shield. An example of the recommended apparatus for consistently reproducing the high velocity test is shown in Figure 2. The Z87.1-2010 standard specifies that the 300 ft/s speed must be achieved no further than 25 cm from the point of impact. A high mass test is also used for rating for Z87+, in which a 500 g pointed projectile, the geometry of which is shown in Figure 3, is dropped from a height of 50 inches. If the face shield does not dent, crack, or displace from the frame, it earns the Z87+ rating . Fig 2: The recommended apparatus for the high velocity impact test. Fig. 3: The geometry of the high-mass test impact missile . Corroborating the kinetic energy calculations for both the high mass and high velocity tests with other sources, it is known that shields that can withstand an impact of at least 4.41 Joules of energy hold an ANSI rating of Z87+, and must pass both the high velocity and high impact tests. However, it should be noted that the powered respirators may carry the Z87+ rating but can have a thinner piece of plastic than most face shields . Further investigation into the background of the Z87.1 standard revealed that the parameters set by ANSI/ISEA to establish the safety ratings are largely arbitrary and that the organization itself is self-regulating, so examination is needed to ascertain whether a safety rating for “high impact” has any practical meaning for wood turners. The initial approach to this experiment was to build a pendulum that would generate the same angular momentum as a that of the rotating pieces of wood that could possibly break off while woodworking on a lathe. Three different wood types were chosen with four different diameter/length combinations to create cylinders, or dowels, which would form the impact head of the pendulum. The maximum angular momentums (tables seen below) were then calculated for those twelve combinations. The results of the calculations for each wood species/diameter/length/spindle speed combination are shown in Tables 1-3. Upon further research, it was determined that using a pendulum would not sufficiently translate the energy generated from the pieces of wood into the face shield. The pendulum could not store enough energy to deliver the impact force at the desired magnitude, so an alternate experimental setup was devised. Rather than creating separate pendulums with different impact heads, an air cannon could be constructed using an air compressor, a butterfly valve, and a length of Schedule 40 steel pipe. Pressure from the compressed air is released when the valve is opened, pushing the projectile, a wooden dowel, down and out the length of the barrel. Initially, a similar approach to the pendulum-based experiment was taken for dowel geometry relating to mass: each dowel would be the same length, and the radius of each dowel would be scaled from 0.5” to 2” in steps of 0.5”. The airflow would be restricted for the smaller sized dowels using an O-ring or rubber stopper. Initial mass and calculations were conducted with these parameters in mind . However, it was determined to be more efficient to have dowels of the same diameter to minimize pressure loss down the length of the barrel, so the dowels would be scaled by length to achieve the same mass as their diameter-based counterparts with a 2” diameter. Because each dowel had the same diameter, only one cannon needed to be constructed to accommodate all of the different dowel lengths, so all of the parameters listed above are the same for the exit velocity calculation except for the mass of the dowel. Equation (4) was used to determine the size of a piece of wood needed to generate 4 Joules of energy at the instant of exit from the barrel. Only wooden dowels were considered for these calculations and ultimately tested. The final set up for the air cannon used an air compressor with a 100 psig capacity connected to a 2 ft length of pipe with a 1 ¼” diameter. Several adapters were applied in series to allow the ¼” fitting of the air compressor hose to connect to the 1 ¼” pipe. To measure the velocity of the projectile, the cannon was set at a 45 degree angle from the ground on a ramp approximately three feet from the ground and secured as shown in the picture below. At this angle, an equation can be used to approximate the velocity of the projectile, where Vo is the exit velocity, d is the horizontal distance traveled by the dowel while airborne, and g is acceleration due to gravity. Fig. 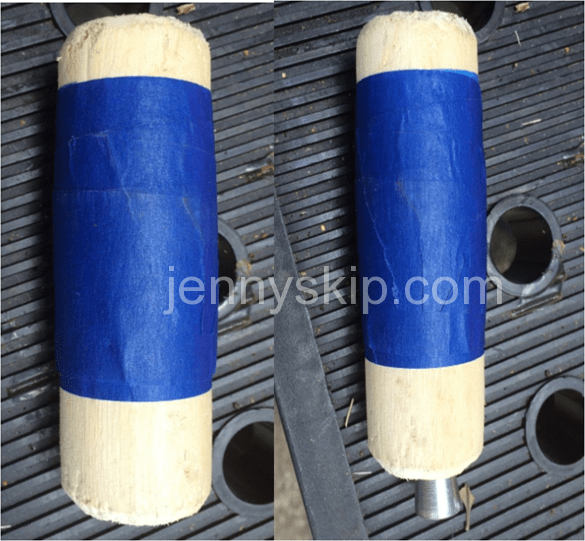 4: The unweighted 1 oz dowel (left) and the same dowel with the 2 oz weight added (right). Fig. 5: The testing setup configuration for the air cannon during data collection. The same dowel was fired from the cannon several times for data collection. The first tests utilized an oak dowel weighing one ounce, but due to the lightness of the dowel and the clearance between the dowel and the walls of the cannon, too much pressure was lost along the length of the cannon, and the exit velocity was considerably less than predicted as a result. The next series of tests used a 1 oz dowel with a 2 oz metal bolt inserted along the length of the dowel. The same 3 oz projectile was fired from the cannon five times, and each distance was recorded. When testing the 1 oz. dowel, the average distance when shot at 45 degrees was 37 feet. Plugging those variables into the energy equation, we determined the 1 oz. dowel generated 1 Joule of energy. The 3 oz. dowel was then loaded into the air cannon and again shot at 45 degrees, the average distance was 47 feet and generated roughly 4 joules of energy. To get a better understanding of what that 4 J of energy translates to, the air cannon was laid flat on the table and the 3 oz. 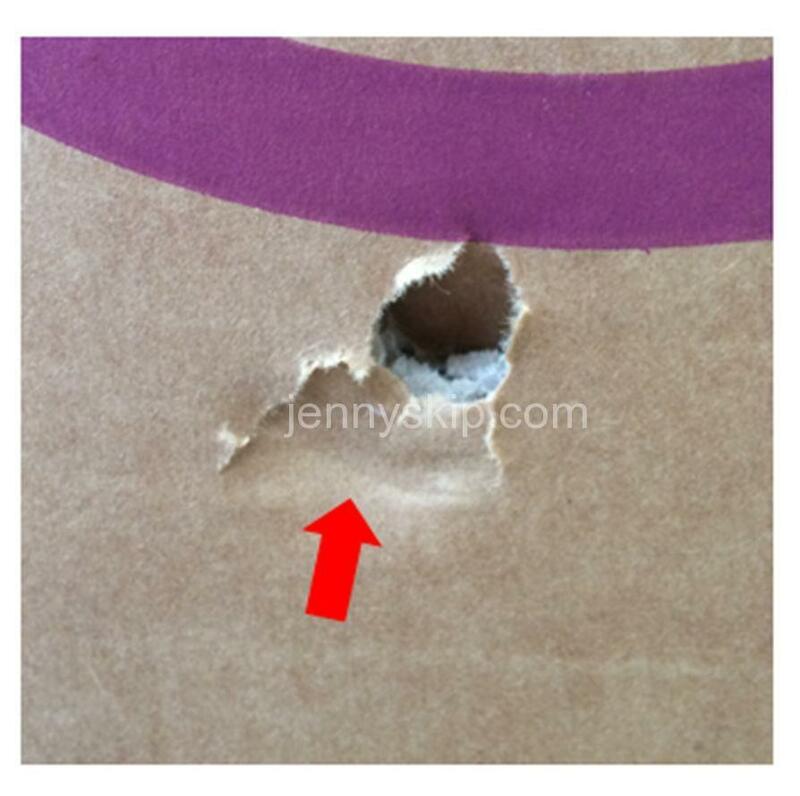 dowel was shot at a sheet of cardboard that was held roughly 18 inches away. The picture below shows the results of that test. It should be noted that the hole in the center of the impact was due to the metal weight that was inserted into the center of the dowel to increase its mass, however the indented ring around that center hole was caused by the impact of the dowel. Fig. 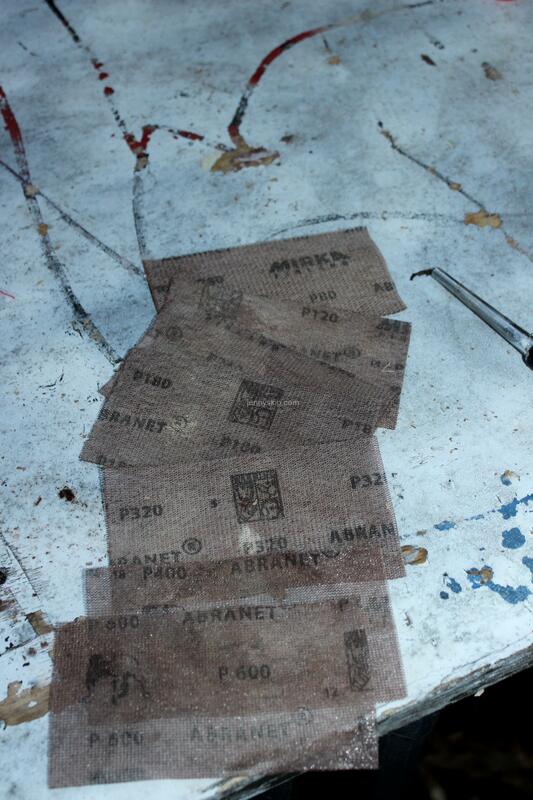 6: A photograph of the damage dealt to the cardboard sheet by the dowel. The dented, unpunctured section highlighted by the arrow is the impact of the dowel itself. After reviewing the results of the experiment, it became known that there were scenarios within the scope of the study for which even faceshields rated for Z87+ impact would not adequately absorb the energy from an impact. Rather than replicate these impacts with further tests from the air cannon, a theoretical study was conducted to determine maximum safe conditions for turning operations in a variety of circumstances. Because the high velocity impact test described earlier is conducted with a horizontally-moving projectile, the impact energy is equated to the kinetic energy of the projectile. 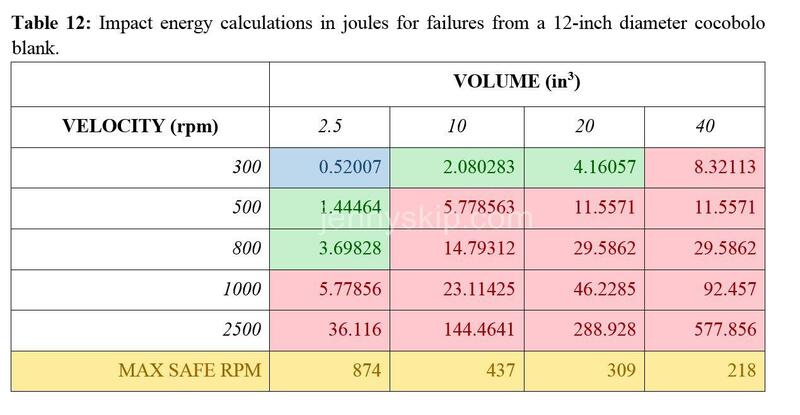 The impact energy is calculated at five rotational velocities for three species of wood and three blank diameters from which failures can eject. The volume of the projectiles being evaluated are rough approximations of the volumes of the two-inch diameter dowels used in the air cannon experiment which are detailed in Table 4. The table cells colored blue in Tables 5-13 are those containing impact energy values for which a basic-level rated shield is sufficiently safe, those colored green are safe for Z87+ rated shields, and the red cells denote scenarios for which there is a risk for injury even when wearing a “high impact” face shield. 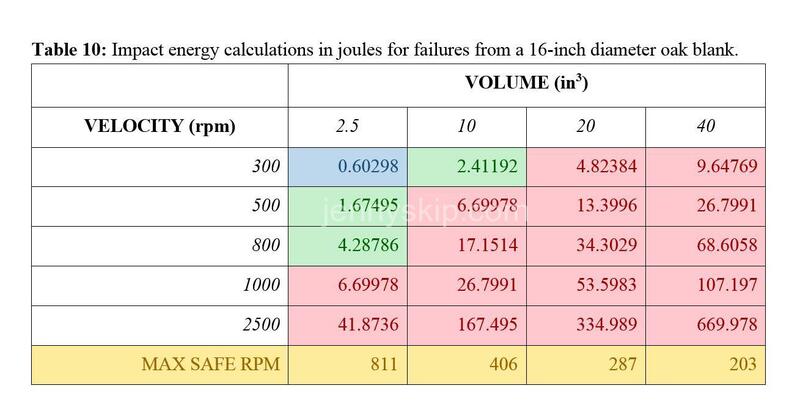 The bottom row of each table contains the calculated RPM value for which it is safe to turn a workpiece on a lathe to be completely protected from the force of impact by a projectile of the specified volume. To provide some illustration of the volumetric dimensions, a cube of volume 2.5 in3 would have an edge length of approximately 1.35 inches, a 10 in3 cube has edge length of about 2.15 in (about 1.5x the size of the 2.5 in3 cube), a 20 in3 cube has edge length 2.71 in (2x the size of the 2.5 in3 cube), and a 40 in3 cube has edge length 3.42 in (2.5x the size of the 2.5 in3 cube). The results of this study show that shields rated to only basic Z87 impact standards protect against wood lathe failures of small size and should be used only when turning at low spindle speeds. Shields rated to Z87+ will protect against impact from some larger failures at higher spindle speeds, but the range of safety coverage is still greater at low speeds for all woods. It is uncommon for wood turning operations occurring at spindle speeds like 2500 RPM to be much more than surface finishing, so the likelihood of encountering dangerous failures at such speeds is low as long as good woodworking discipline and general common sense are employed when working at the lathe. It can be seen from the tables that even a Z87+ shield will not protect the wearer from injury against especially large failure impacts. With this information in hand, it is desirable to develop a face shield which will guarantee the safety of the wearer. Improvements can be made to current designs to increase the suitability of commercial face shields to withstand impact forces such as those delivered by the previously described wood lathe failures. For example, adding thickness to the polycarbonate shield itself will increase the rigidity of the shield, preventing it from deforming under the pressure of the impact. A riot helmet containing a face shield is subject to a separate safety standard set by the National Institute of Justice. In their standard NIJ-0104.02, the criteria for face shield impact testing is similar in process to that of ANSI/ISEA Z87.1-2010, but the impactor used to verify that the shield meets the standard is a 45-mm diameter cylinder with a weight of 1 kg being dropped from a height of 80 cm . This would suggest that the shield on a riot helmet must be able to absorb approximately 7.85 J of energy. Using this value in accordance with Tables 5-13 shows a significant increase in the range of the conditions deemed safe or minimally hazardous for lathe failure impacts. The thickness of riot helmet face shields is on average about 3/16”, while the polycarbonate on the face shields tested in the experiment ranged from 0.1-0.15 inches . An alternative solution to increasing the ability of the face shield to protect the wearer is to incorporate existing methods of head and face protection used in other types of helmets, particularly those used in contact sports. Football and hockey helmets contain a lattice of thick wire bars which are used to distribute the force from impacts from objects such as hockey pucks, which are of approximately the same dimensions as some of the lathe failures analyzed in this report, which would be equally effective, if properly arranged, in protecting against impacts encountered in wood turning. These can be secured to the polycarbonate face shield to prevent the full contact area of the projectile from impacting the shield itself, and the remaining energy can be absorbed by the shield without significantly reducing the wearer’s field of vision. This would also reduce the risk of large wood projectiles denting or cracking the shield. Sports helmets also include padding in the helmet itself so that when impact forces are encountered, the rigid plastic does not transfer the full force of the impact to the wearer’s head. Similar cushioning can be implemented into wood turning-appropriate face shields, particularly the forehead and potentially the chin, to mitigate the effects of a collision with a lathe failure projectile. In this study, the ability of a face shield which was deemed able to protect its wearer from injury when impacted was tested against actual workpiece failure scenarios for wood turning operations on a lathe. 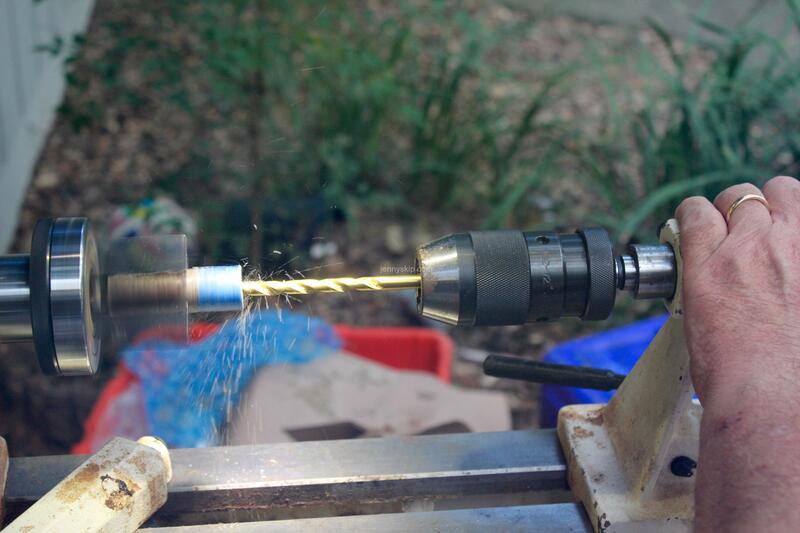 Tests were conducted using an air cannon to determine the impact force of a wood projectile delivered to a shield and to set a basis for further theoretical analysis to better define the boundaries of safe operation for real-world wood lathe use. It was discovered that the application of the “Z87+” label to rated shields does not necessarily protect the wearer from highmass and/or high-velocity impacts, and data was tabulated to provide a clearer picture to wood turners to what degree they are protected by their headgear. Face shields rated for basic impact were found to be almost entirely inadequate for protection against all but the lowest-intensity evaluated conditions, and even those rated for higher impact did not cover the majority of scenarios. Further expansion of this study should include an analysis of how the energy calculations translate to degree of danger posed by the impacts to the health of the wearer at each condition, particularly which scenarios can prove excessively harmful or fatal, even when proper head protection is in use. A. Chen, “Are You Wearing the Right Faceshield, American Woodturner”, vol. 25:2, pp. A. Jackson, D. Day and S. Jennings, The Complete Manual of Woodworking, 13th ed., NY, Alfred A. Knopf Inc., 2012. A. Rao, Dynamics of Particles and Rigid Bodies: A Systematic Approach, 2nd ed., Cambridge U.K., Cambridge University Press, April 2011. H. Carpenter, “Safety for Woodturners: On the Edge of Disaster, American Woodturner”, vol. 27:4, 2013, pp.16. J. English, “Wood Dust Solutions, American Woodturner”, vol. 25:2, pp. 20, April 2010. R.G. Chandavale and T. Dutta, “Correction of Charpy Impact Values for Kinetic Energy of Test Specimen” in Pendulum Impact Machines: Procedures and Specimens for Verification, T.A. Siewert and A.K. Schmider Eds., Philadelphia PA, American Society for Testing and Materials, 1995, pp. 221-231. Time-Life Books, The Art of Woodworking: Woodturning, Alexandria VA, St. Remy Press, 1994. W.H. Wagner and C.E. Kicklighter, Modern Woodworking: Tools, Materials, and Processes, 6th ed., South Holland IL, The Goodheart-Wilcox Company Inc., 1986. Z.J. Rohrbach, T.R. Buresh, M.J. Madsen, ” Modeling the exit velocity of a compressed air cannon,” Am. J. Phys., vol. 80, no. 1, pp. 24-26, January 2012.
	International Safety Equipment Association, “American National Standard for Occupational and Educational Eye and Face Protection Devices ANSI/ISEA Z87.1-2010,” International Safety Equipment Association, Arlington, 2010. “Adjustable Face Shield,” Harbor Freight Tools, [Online]. Available: http://www.harborfreight.com/adjustable-face-shield-46526.html. Face Shields,” October 1984. [Online]. Available: https://www.ncjrs.gov/pdffiles1/nij/097212.pdf. “Riot Face Shield,” Gentex, [Online]. 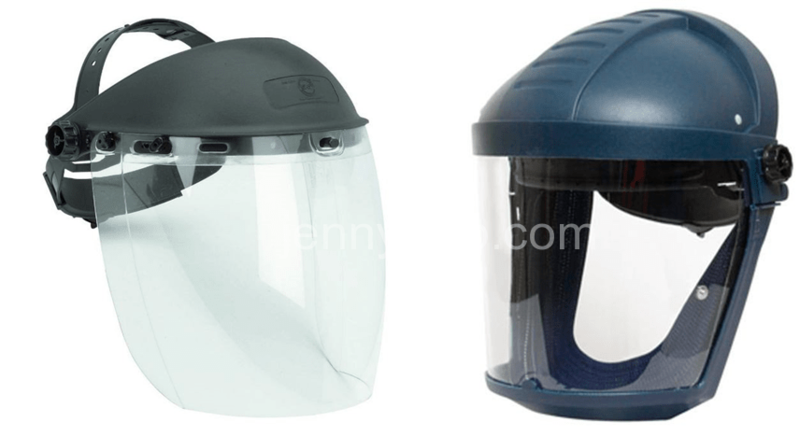 Available: http://www.gentexcorp.com/shopaviationhelmets/ground-accessories/eye-face-protection/faceshields/riot-face-shield. Do not use any information in these posts without permission. The stabilized cigar halves sat around the house for several days because it rained…and also, the main participant in the project broke his ankle. Once the boot was installed on his broken pin, and the weather cleared up for a few hours, the cigar pen project was back in play. 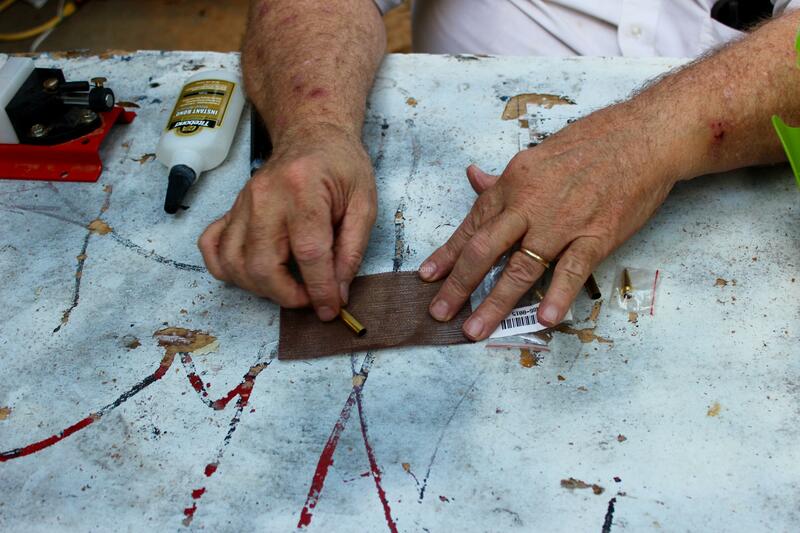 First step was to drill out the centers of the cigar pieces, to make room for brass tubes from the pen kit. 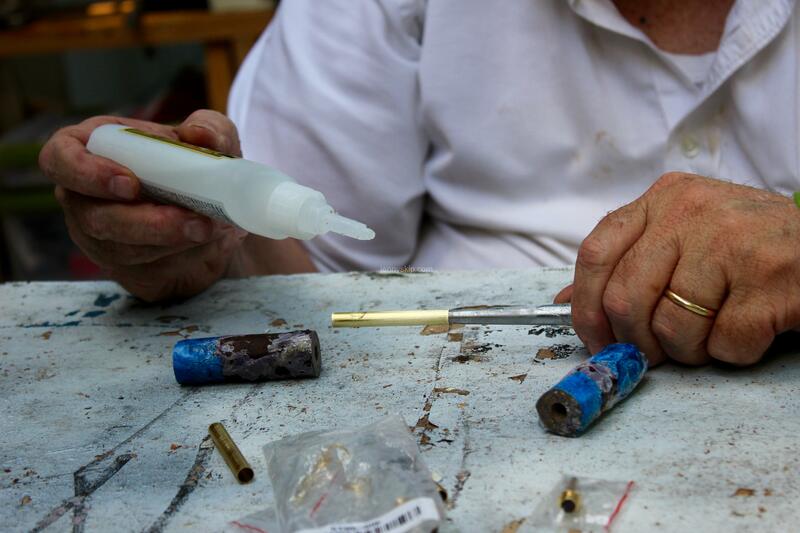 Next, putting a little “tooth” on the outside surfaces of the brass pen tubes by sanding with 80 grit Abranet, so they adhere better when they’re glued inside the cigar pieces. 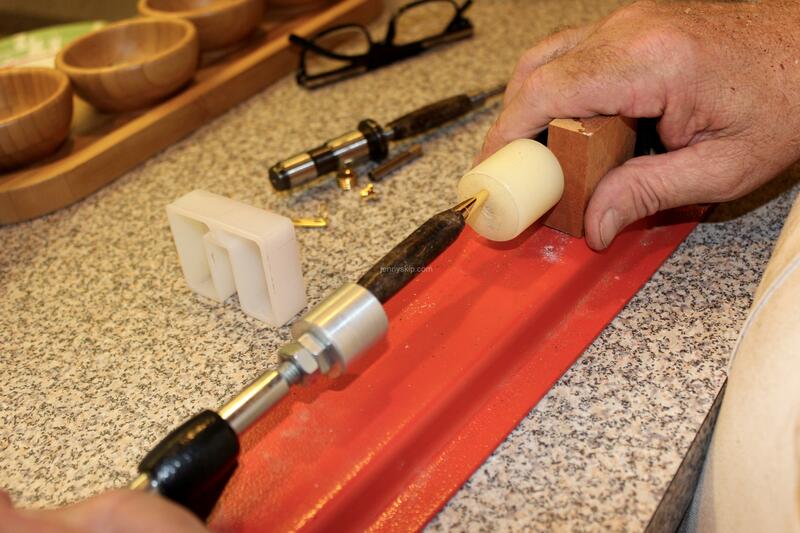 Next, gluing the brass pen tubes into the drilled-out centers of the cigar pieces. The cigar halves, with their glued-in brass tubes, are then sanded on the disk sander until the ends are even with the outer edges of the brass tubes. 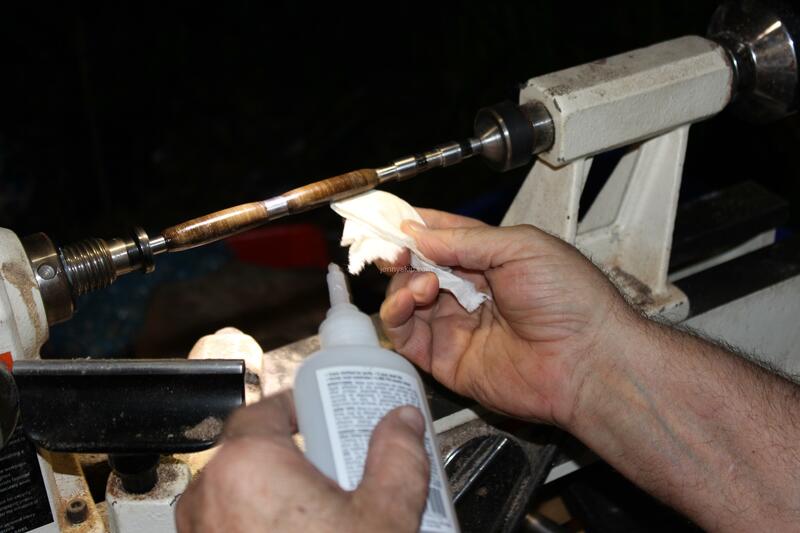 The cigar pieces are slid onto a pen mandrel and mounted onto a lathe to be turned and trimmed using a Rockler round carbide mini turning tool. Next, many applications of 1) thin CA glue and 2) spray-on accelerator, then sanding with more Abranet from 80 grit to 600 grit. After several coats of high-friction polish, then several coats of thick CA glue were applied, to fill in lots of little divots and voids that were chipped out by the turning tool. Even though the cigar was stabilized with resin, it wasn’t completely smooth and rock-hard. It was very chippy. The final finessing step is wet sanding with a series of water-soaked sanding pads in grits 600 to 20,000. The rest of the pen parts from the kit are pressed into place. There, a cigar that isn’t bad for your health! Maybe next time we’ll get a Cuban cigar and see if it turns out any different.